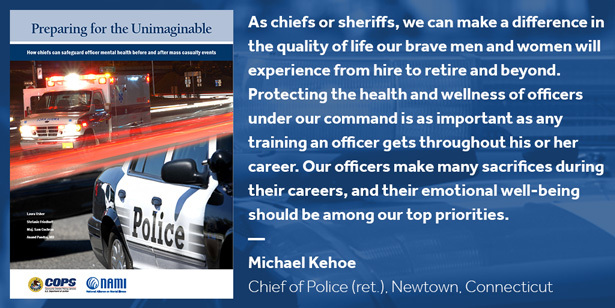 In May 2016, NAMI released a guide for police leaders, Preparing for the Unimaginable, to prepare for mass casualty events and to support emotional resiliency for first-response personnel as well as their communities. …will provide chiefs and sheriffs with awareness and guidance on best practices for safeguarding mental health and wellness of first responders in the early moments of critical events and during the long aftermath. Despite recent unfortunate events, police officials and mental health professionals involved in developing the guide agree that mass casualty events are unlikely in any specific community. But preparation is essential in case the unimaginable ever does occur.